FIG. 32. Another rendering of the same subject. Slow Tempo. 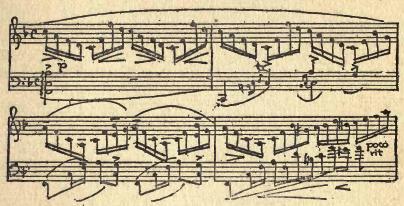 Accompaniment in the right hand half-strength with thrown fingers left-hand melody brought out with accents as marked. In the right hand undulate movement expressed by a diminuendo and crescendo. The impression is one of movement birds singing, or water rippling. 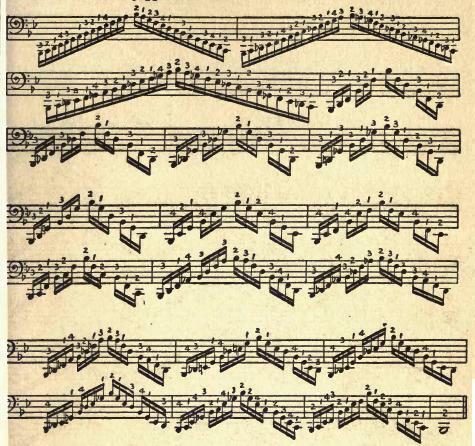 Another detail which it is necessary for the student to bear in mind is that technical passages ought never to be played as if they were of purely digital dexterity, as this method makes of such passages only hard, uninteresting interludes of display, wearisome to the listener and of no value musically. All technical passages, even the most difficult ones, should be considered as embroideries of that main harmonies; in fact, they are the rhetoric of the composition. Melody also should not be knocked out with unbalanced enthusiasm to the entire detriment of the accompaniment, nor should any two notes of a melody be given with exactly the same tone color, for this will create monotony of sound. Every single tone should be on a general scale of gradation, each having its own place in the scheme of chiaroscuro; because the mechanical tone of the piano itself, with which we are dealing, makes it imperative that every device to conjure up perspective and charm should be brought into service, and above all typewriting effects of precise striking must be strenuously avoided.